A digital rendering shows what the European Extremely Large Telescope will look like. Construction will soon begin on what is slated to be the largest optical telescope ever built. 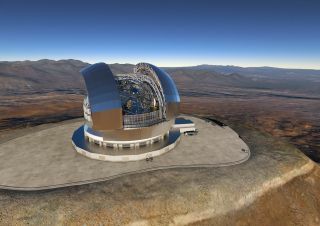 Today (May 25), the European Southern Observatory announced that it has selected a contractor to build the dome and main facility of the European Extremely Large Telescope (E-ELT) in the mountains of the Atacama Desert in Chile. "This is the largest contract ever awarded by ESO and also the largest contract ever in ground-based astronomy," ESO officials said in a statement. "Construction of the dome and telescope structure will now commence." ESO is an intergovernmental astronomy organization established in 1962, and is supported by 15 European countries, as well as Brazil and Chile, where ESO has three observatories: the Paranal Observatory, the Very Large Telescope and the Atacama Large Millimeter Array. The E-ELT is being pursued in two phases, the first of which is more than 90 percent funded, according to ESO, and includes the construction of the telescope facility and the crafting of a majority of the telescope's mirror segments. The ESO Council approved the start of the first phase of construction in 2014. The E-ELT could start making observations as early as 2024, the organization has said; if funding is delayed, first observations could be pushed to 2026. E-ELT, which will see the universe in both optical and infrared light, is one of three "extremely large" ground-based optical telescopes set to come online in the 2020s. These enormous telescopes will increase the resolution of optical images of the universe, allowing scientists to see deeper into the universe than ever before, study fainter and more distant objects, and answer many standing questions in physics, astronomy and cosmology. At a news conference today, Paolo Padovani, an ESO astronomer and a member of the E-ELT science office, outlined some of the primary areas of interest that E-ELT will probe. E-ELT will provide a high-resolution view of galaxies of various ages, and thus help fill in the story of how typical galaxies form, how they live and how they change over time. By staring at the centers of distant galaxies for long periods of time, E-ELT will provide evidence that most galaxies have a monstrously large black hole at their center. This technique was also used to demonstrate that there is a monster black hole at the center of the Milky Way, but most galaxies are too far away for current telescopes to perform similar studies. E-ELT could help in the hunt for exoplanets and, according to Padovani, gather information about the atmospheres of exoplanets, potentially revealing signatures of biological activity. The list of scientific questions that E-ELT will be able to probe goes on, but Padovani also said the telescope would reveal new information about the universe that scientists can't yet predict. "ELT is going to make some amazing discoveries, but we don't have the faintest idea of what many of them are going to be," he said. "That's what makes astronomy very special." Two other "extremely large" telescopes are currently under construction: the Thirty Meter Telescope (TMT) in Hawaii and the Giant Magellan Telescope (GMT), which will be located in the Atacama Desert in Chile along with the E-ELT. The GMT will have an aperture of 80.3 feet (24.5 m), and is currently scheduled to start an early science phase in 2023 and work up to full operation by 2025, according to Patrick McCarthy, project director for GMT and an astronomer with Carnegie Observatories. The TMT will have an aperture of 98.4 feet (30 m), and previous estimates suggested it would start taking data as early as 2022. However, a controversy over the site of the telescope might have delayed that schedule. The three telescopes are sometimes described as competitors, but McCarthy told Space.com that the needs of the astronomy community cannot be met by a single telescope. With most observatories, astronomers submit an application that describes the research they would like to conduct with the instrument, but McCarthy said demand far exceeds the available supply. When plans were underway for the first generation of 8- and 10-meter-scale (26 and 33 feet) telescopes (such as the Keck Observatory in Hawaii), people also wondered why more than one instrument would be necessary, McCarthy said. "And now, there are roughly 14 or 16 8-meter-scale telescopes all around the world, and yet getting observing time on those telescopes is very difficult " McCarthy said. "You think about the global community of astronomers, people all around the world with good ideas. One telescope would simply limit the rate at which we could do science, and would deprive a lot of smart, young people of the opportunity to get their experiments on the sky."